Macroautophagy, Microautophagy and Chaperone-mediated autophagy. The terms autophagy and macroautophagy are used interchangeably. Autophagy is a lysosomal degradation pathway that is essential for survival, differentiation, development, and homeostasis. Under certain circumstances, it is considered as a non-apoptotic cell death pathway. Autophagy is involved in diverse pathologies, including infections, cancer, neurodegeneration and aging as well as in heart, liver and kidney diseases. Macroautophagy is a multistep process by which portions of cytoplasm, damaged proteins and/or organelles are sequestered in a double or multimembrane structure (autophagosome). Upon fusion of the autophagosome with the lysosome (autophagolysosome), sequestered materials are digested by lysosomal hydrolases. The recycling of these intracellular constituents serves as an alternative energy source during periods of metabolic stress to maintain homeostasis and viability. The formation of autophagosomes is controlled by a complex interplay between activating and/or inhibitory proteins. The early step of this process is controlled by the formation of a complex between the autophagy execution protein Beclin1 (also named Autophagy-related gene 6, Atg6) and several protein partners among which Bcl-2 (B-cell CLL/lymphoma-2), UVRAG (Ultra-Violet irradiation Resistance-Associated Gene), Bif-1 (Bax-interacting factor 1), Ambra1 (Activating Molecule in Beclin-1-Regulated Autophagy), the class III phosphatidylinositol 3 kinase PI3K (also known as Vps34), its regulatory subunit 4 (also known as p150 or Vps15), and the newly described Rubicon and Atg14L proteins. The following step is essential for the elongation and maturation of the phagophore and for the sequential recruitment of other Atg proteins. The generated phosphatidylinositol-3-phosphate (PI3P) interacts with WIPI-1 protein (WD-repeat protein Interacting with Phospho Inosides) which is required for the recruitment of membranes. Thus, Atg12 conjugates with Atg5 and promotes the expansion of the vacuoles and conjugation of the MAP1LC3 (Microtuble-associated protein light chain 3, LC3). LC3 is cleaved at its COOH terminus to produce the cytosolic LC3-I form which is converted to LC3-II by covalent association with phosphatidylethanolamine (PE) lipid in the luminal side of autophagosomal membrane. The last step in this process is the fusion between the maturated autophagosome and lysosomes, and the degradation of the sequestered material, including LC3-II protein. The LC3 is therefore considered as one of the specific markers used to monitor autophagy in cells. The maturation of autophagosomes requires the activity of Rab GTPases (Rab7 and Rab24). The recruitment of polyubiquitinated protein aggregates to the autophagosomes is mediated by the polyubiquitin-binding protein p62/SQSTM1. Recent evidence suggests that autophagy can be induced in a Beclin1 and PI3K independent manner. 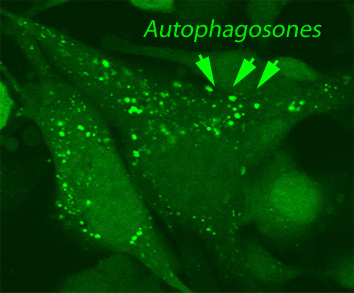 Termed non-canonical autophagy, this process does not require the entire set of Atg proteins to form the autophagosome. This database provides scientists working in the autophagy field an overview of this phenomenon. Listed above are some excellent reviews that describe details about the molecular mechanisms and the regulation of autophagy. Mizushima et al., Nature 451, 1069-1075 (2008); Levine and Kroemer, Cell 132, 27-42 (2008).